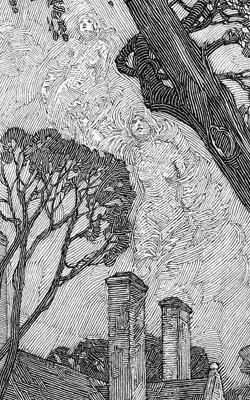 Franklin Booth owed his amazing style of pen and ink drawing to ignorance. 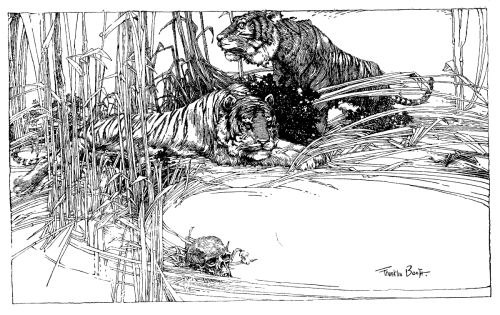 Booth was one of the greatest American illustrators and one of the absolute masters of pen and ink drawing. His style was the result of an isolated childhood on an Indiana farm and an innocent ignorance of the printing technology of his time. 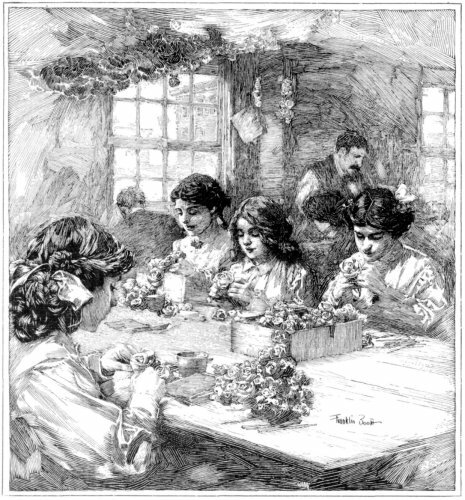 When Booth was growing up, determined to be an artist and create illustrations like the ones he saw in popular magazines of the day like Harper’s and Scribner’s, he began to teach himself to draw in pen and ink by copying the illustrations as he saw them, not realizing that the illustrations were the product of wood engravings, made by specialty engravers by copying the original artists’ works. 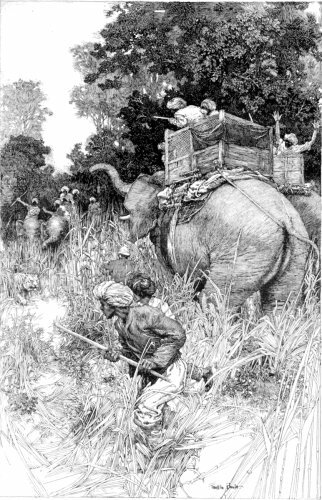 In the process of unknowingly emulating the engravers’ intricate lines, Booth created a unique style of pen drawing that has since been imitated but never matched. His drawings are marvels of tone created in line. The textures of the world, faces, clothing, atmospheric effects, sweeping skies, roiling clouds, the vibrance of forests and fields, are created from thousands of precisely placed pen lines, spaced and arranged to blend in the eye into optical tones of grays. Actually, “tones” and “grays” don’t do Booth enough credit, his black and white drawings suggest colors in the the mind, in much the same way as Van Gogh’s wonderfully textured drawings; or like the “colors” of the grays in Chinese ink painting. In fact, one of the books on Booth that I’ll recommend to you is subtitled “Painter with a Pen”. The extraordinary power and visual force of Booth’s works were a dramatic influence on his contemporary Golden Age illustrators like Howard Pyle, 20th century artists and illustrators like Virgil Finlay, Roy Krenkel and Frank Frazetta, classic comic strip artists like Hal Foster and Alex Raymond and modern comics artists like Berni Wrightson (whose amazing Frankenstein portfolio was a homage to Booth) and Frank Cho (who will occasionally devote a whole strip to one of his pastiches of Booth’s style) . I’ve been on the web a long time and I’ve found that if you wait long enough, resources that didn’t exist will eventually be posted. I’m still a little disappointed, though, with the small amount of online resources for brilliant artists like Franklin Booth, particularly considering that his work is in the public domain. That being said, I have been able to dig up a few web resources for you, and, more importantly, a couple of absolutely terrific print resources. I say more importantly because to really appreciate Booth’s precise lines, magnificent scope and astonishing level of detail, you need to see his drawings in the high-resolution of print rather than the low resolution of screen images. 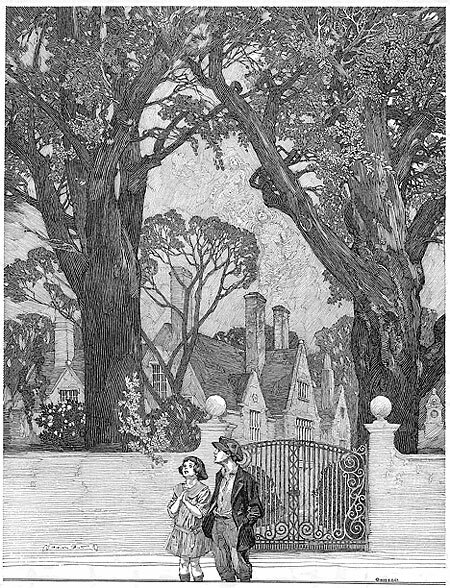 When I first discovered Booth, I went crazy trying to find his work in print and was sad to discover that the only major book of his work, Franklin Booth: 60 Drawings, and the Nostalgia Press reprint of it from the 70’s as The Art of Franklin Booth, were both out of print and expensive on the rare book market; but you (you luck devils) now have access to two recent, and absolutely great, collections of his drawings. The first, Franklin Booth: Painter with a Pen from Flesk Publications, is temporarily out of print, but will be reprinted this July. The other is Franklin Booth: American Illustrator, a new release from Auad Publishing, which includes some of Booth’s rarely seen color illustrations. There are Booth galleries on the Flesk site, and the Auad site, though the images on both are too small to get a real feeling for how amazing his drawings are when seen on the printed page. Both of the books are very reasonably priced and I can’t recommend them highly enough to anyone interested in just how amazing pen and ink illustration can be. 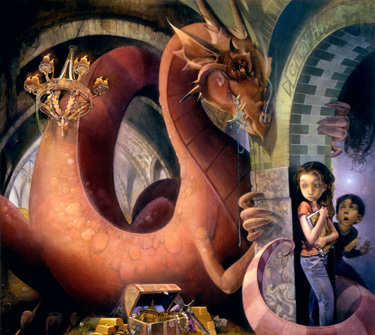 According to his bio, illustrator Greg Swearingen’s career started in junior high school when he was commissioned to draw a dragon for one dollar. Since then, his commissions have picked up somewhat and include clients like Random House, Simon & Schuster, Harcourt Brace, Harper Collins and Tor Books. He credits his teachers at the Columbus College of Art, who included C.F. Payne and Joe Kovach, with helping him to forge his artistic direction. He lists some of his other favorite illustrators as Andrej Dugin and Olga Dugina, Jessie Wilcox Smith, and Peter McCarty. Swearingen’s work has been featured in Communications Arts and the Spectrum collections of contemporary fantastic art as well as a number of Society of Illustrators exhibitions. 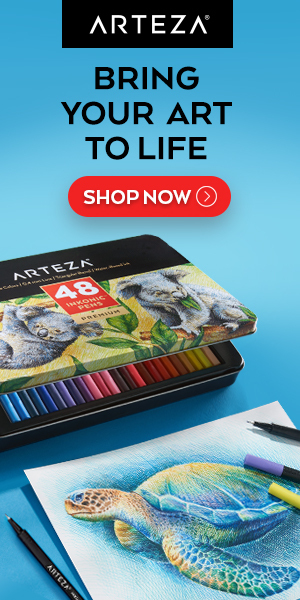 Unfortunately, the samples on his site are much too small to get a feeling for the actual appeal of his work, which is often in the wonderful textures he creates with his mixed media approach that combines acrylic, watercolor and colored pencil. The galleries on the site of his rep at KIDshannon are a bit larger, but still frustratingly small. Look for his work in one of the recent Spectrum collections or, better yet, of course, in one the the actual books he has illustrated. Daniel Cox is an Australian concept artist and matte painter working at Weta Digtital, the special effects house that was behind the Lord of the Rings movies and Peter Jackson’s remake of King Kong. Cox is working with them on projects like Fantastic Four 2: The Rise of the Silver Surfer, 30 Days of Night and Avatar. When he’s not drawing and painting for his job, he likes to relax and have fun by drawing and painting for his blog, a Little Golden Blog (the title graphic of which is a nice pastiche of the Little Golden Book kid’s book line). 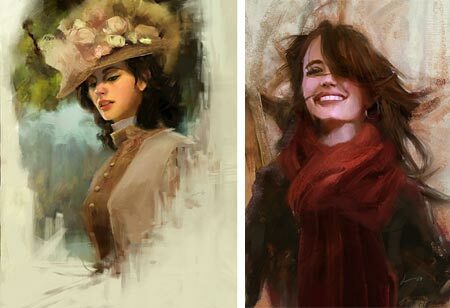 He likes to keep his painting chops up with sketches and paintings of various playful subjects, doing his take on characters like Conan, Judge Dredd, Hellboy or Wonder Woman; or with quick studies from photographs. In particular he enjoys doing digital and traditional media paintings from promo photos or movie stills of actors like Morena Baccarin (from Serenity) or Eva Green (images above). Cox no longer maintains a web site with a gallery of his professional work, but if you go back in the blog archives you can find some postings for production designs and matte paintings for movie projects and ad spots. Some of his cartoon-like sketches are quite funny, like his Wyle E. Cyote in 300 parody or his take on Batman’s Harley Quinn as an aging barfly. Here’s an update on some webcomics that I’ve mentioned previously, some quite a while ago, on lines and colors. Kazu Kibuishi’s delightful Copper was the first webcomic I profiled on lines and colors, and one of my very first posts, I also wrote an update about his terrific post about his creative process for the strip. To say Kibuishi is busy at the moment is an understatement. He’s launching the new Flight 4 comics anthology, which he edits and contributes to, he’s working on his first long-form comics story, Amulet, which I and many others are very much looking forward to, he continues to update both his site and the Flight blog, and, oh yes…, he’s getting married; so he can be forgiven for putting Copper, in all its wistful, beautiful, elegant simplicity, on hiatus for a while. At page 11 when I first mentioned it, Trade Loffler’s charming and beautifully realized comic story about a young boy and his sister has wrapped up its first adventure, The Upside-Down Me, at 62 pages. Much to the delight of readers like myself, Loffler promises the start of a new adventure, The Sky Kayak, in September. When I first mentioned my elation that Steve Purcell was producing a new webcomic featuring Sam n’ Max, his “funny animal” characters that actually are deserving of both terms, it has just started at page one. It’s now up to page 10, and chock full of the wonderful absurdist mayhem that Sam n’ Max fans have come to know and love. The strips are interactive in that the word balloons and sound effects aren’t visible until you roll your mouse over the panel. Steve Hogan’s delightfully bizarre and funny romp through 60’s pop culture and 90’s deadpan humor has added a few pages since I wrote about it. The story is about…, well it’s about weird stuff, wonderfully drawn weird stuff. It’s up to page 34. Starts here. This charming comics story by Ben Hatke, which I wrote about last October, has been infrequently updated (though not as badly as some, see my last item, below), but has recently added a new page. At the other end of the spectrum, at least in terms of consistent updates, is Argon Zark!, which is my own webcomic. It does, however have the distinction of being the first and longest-running long-form webcomic, having started in June of 1995. I am trying hard to update it more frequently, but I just have so much fun putting in all the details that it takes me forever to do a page. (Hint: click around.) I’ve just added a new page, but it’s better to read from the beginning of the current story, or from the start of the first adventure. Jared Shear is a painter with several blogs. One is called Terra Peer, meaning “World View”, and is devoted to his view of the world as expressed in small, immediate landscape paintings and studies. He would probably prefer that I had chosen a more fully realized small painting to represent his work, rather than the “quick study” shown here; but it’s these small gouache studies that caught my eye in particular and prompted me to write the post. I was just taken with the fresh, lively and un-fussed-with nature of these studies, and the wonderful economy of notation. I love the way clouds in this one are indicated with a few fast strokes of lighter blue, and the atmospheric perspective is reduced to a simple color choice. Most of the images on the blog are a more fully realized, many in gouache, some in oil or acrylic, but most are painted en plein air and keep the immediate feeling of rapidly painted studies. He often focuses his images on streaks of sunlight across the ground, contrasted with less brightly lit passages, a compositional device I like very much. Shear is based in Montana and his images reflect that area’s mountainous landscape. One of the other painting blogs he keeps is Cougar Peak-a-Boo, a project in which he has set out to paint the same peak with one painting a day for a year, capturing in the process its many moods, colors and atmospheric changes. Shear also contributes to Paper Skin, a collaborative blog devoted to “the human landscape”, that he shares with jake parks and “Pooboy”. Shear also has a regular web site, ZupZup Studio that includes his larger studio work, as well as sketches, drawings, studies and his small plein air paintings. The Terra Peer blog also features some of Shear’s experiments digital painting, including reproducing classic paperback science fiction illustrations in Painter or Photoshop to increase his facility with those applications. There are also some Illustration Friday exercises. All work together as a great program for extending and improving painting skills. 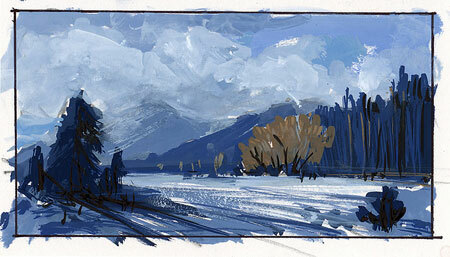 It’s his small gouache studies, though, that I find most appealing. There are two major divisions of digital art. The most prominent and popular in terms of resources, both on the web and in print, is 3-D CGI — the creation of images in software that allows for the modeling, manipulation and rendering of “3-D” objects. This is the technology behind the kind of images in 3-D animation, as in The Incredibles and Monsters, Inc. The other, less popularized area of digital art, and the one of most interest to me, is digital painting, the use of graphics software like Corel Painter, Adobe Photoshop, Autodesk SketchBook Pro and Ambient Design’s wonderfully inexpensive ArtRage, combined with a drawing stylus and pressure sensitive tablet, like those from Wacom, to draw and paint on the computer in a way analogous to drawing and painting with traditional art materials. ImagineFX is a UK magazine devoted to digital art, specifically for the fantasy and science fiction genres and the related field of concept art for movies and games, that has a refreshing emphasis on digital painting. You can often find the print version of the magazine here in the U.S. in college bookstores, specialty magazine or comics shops and the larger chain bookstores. Both the print magazine and the online version offer many of the same features, including step-by-step Workshops in digital art techniques (sometimes offered as downloadable PDF files). 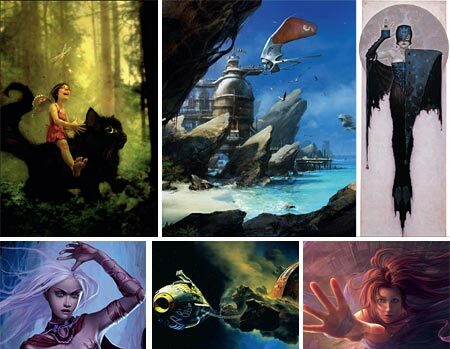 Many of the workshops are by digital artists I’ve featured here on lines and colors, like Linda BergKvist, Phillip Straub, Aly Fell, Robert Chang, Tim Warnock, Jonny Duddle, Melanie Delon, Daryl Mandryk, Frazer Irving and Ryan Church. In addition there are interviews with some of them as well as other artists I’ve featured on lines and and colors, such as Brom, The Bothers Hildebrandt, BARoNTiERi (Thierry Doizon) and Robert Chang. There are also forums, blogs and reviews of computer graphics software, related hardware, DVDs and books; and “Reader FXPosé“, a gallery for readers to display their own work. That taken into account, ImagineFX is a good resource, in both the print and web versions, for anyone interested in digital painting as it applies to fantasy and science fiction illustration and concept art.